The 2016 Ryder Cup starts on Friday and SkyBet have launched a massive promotion! Stake a £10 single or £5 each-way on the Top Overall points scorer before they tee off and get a £5 free bet every time they win a match! This offer is available to new and existing customers! For example, if you back Dustin Johnson to be top points scorer and he wins five matches, Skybet will credit your account with £25 in free bets! Not yet a Skybet customer? Open a new account via our special links and take advantage of their generous welcome bonus! Get a £5 free bet whenever your player wins a match throughout the Ryder Cup. One qualifying bet per customer. Free bet will be credited within 24 hours of your player winning and expires after 7 days. This promotion is available from 10:00 on Sunday 22nd May 2016 until 20:00 on Friday 10th June 2016. This promotion is available from 10:00 on Saturday 24th September 2016 until 13:45 on Friday 30th September 2016 (the “promotional period”). In order to be eligible to receive a free bet under this promotion, customers must place a £10 single or £5 each-way bet on the ‘top overall points scorer’ market (the “qualifying market”) during the promotional period (an “eligible bet”). Customers may only place one eligible bet during the promotion. In cases where more than one selection is placed on the same bet slip, the selection with the lowest bet reference number (i.e. the bet that was placed first) will be the eligible bet for the purpose of this promotion. All subsequent bets will not be deemed as eligible bets for the purpose of this promotion. This promotion can only be redeemed once per customer. You only receive a free bet for each match your player wins. Not each time they get a point (eg. When they get half a point twice). Free bet stakes do not contribute towards an eligible bet. Free bets must be used within 7 days of being credited. Free bet stakes will not be included in any returns. Max free bet per customer / household / IP address is £/€5 each time your player wins during The Ryder Cup 2016. 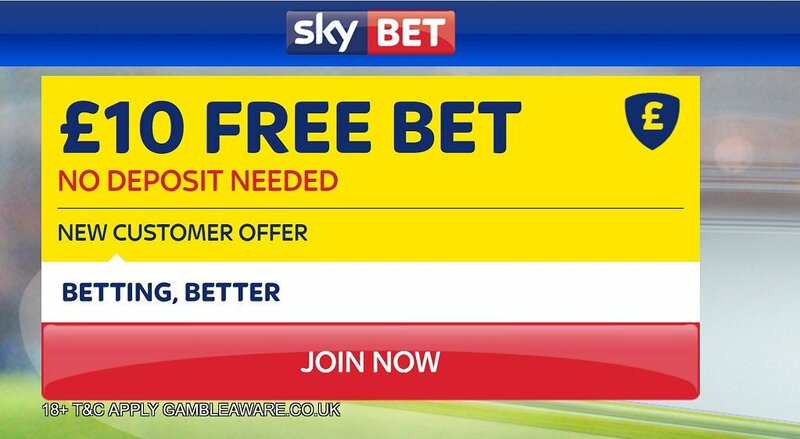 Bonne Terre Limited (trading as Sky Bet) with a registered office address of Office 1, 1 The Crusher, Braye Harbour, Alderney, GY9 3XX is the promoter of this offer. 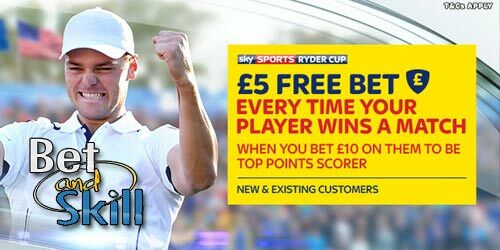 "2016 Ryder Cup - £5 Free Bet EVERY Time Your Player Wins at Skybet"